This review focuses on the mechanisms of stress response in the synovial tissue of rheumatoid arthritis. The major stress factors, such as heat stress, shear stress, proinflammatory cytokines and oxidative stress, are discussed and reviewed, focusing on their potential to induce a stress response in the synovial tissue. Several pathways of stress signalling molecules are found to be activated in the synovial membrane of rheumatoid arthritis; of these the most important examples are heat shock proteins, mitogen-activated protein kinases, stress-activated protein kinases and molecules involved in the oxidative stress pathways. The expression of these pathways in vitro and in vivo as well as the consequences of stress signalling in the rheumatoid synovium are discussed. Stress signalling is part of a cellular response to potentially harmful stimuli and thus is essentially involved in the process of synovitis. Stress signalling pathways are therefore new and promising targets of future anti-rheumatic therapies. Patients with rheumatoid arthritis (RA) are confronted with a multitude of stressful events during the course of their disease. Flares of disease activity with joint pain, swelling and stiffness, progressive damage and subsequent loss of function are hallmarks of RA. These features of chronic inflammation and destruction lead to a harassed and stressed rather than a relaxed life for the patients and their joints. At the microscopic and molecular level of disease, this 'stressful life' must have its counterparts. Understanding the cellular integration of stressful stimuli is of increasing importance and ought to be undertaken in these days of molecular medicine, because it might constitute at least part of the underlying pathogenetic events and thus permit new insights. Under normal physiological conditions the synovial space is one of the most heavily pressured areas in the body. In diseases such as inflammatory arthritis the local conditions can deteriaorate. Several classical stress factors are present in the synovial cavity and these stimuli are likely to influence the function of the cells in the synovial membrane. As in the walls of blood vessels, the synovial cavity is exposed to a high degree of mechanical stress under both normal and pathological conditions. Besides mechanical stress due to the load of body weight, which affects predominantly the joint cartilage, mechanical stress following shear forces is also present. In particular the motion of the synovial fluid during exercise induces shear forces whose biophysics has been studied in detail [1,2]. However, because cells can transduce mechanical stress into biochemical signals, numerous cellular functions can be influenced by the presence of mechanical stress. The biochemical effects of shear stress on the synovial membrane were not studied in detail until recently, and the signal transduction pathways, which are activated, are largely unknown. Mechanical stress has been demonstrated to induce synovial hyperplasia, suggesting the initiation of cellular stimuli of growth and mitogenesis . Indeed, cardiovascular research has demonstrated various effects of mechanical stress on the vessel wall leading to the activation of endothelial cells and to the proliferation of smooth muscle cells [4,5]. Shear forces induce signal transduction via mitogen-activated protein kinases (MAPKs) in these cells by membrane perturbation and the subsequent activation of Ras and Rac G-proteins . By activating the MAPK pathways, mechanical stress gains access to c-jun/c-fos transcription factor activation, which is a central step of cellular activation in several different cell types . Besides MAPKs, mechanical stress also influences other signalling systems, which are activated in the synovial membrane of RA . Nuclear factor (NF)-κB, for example, is one of them and also heat shock proteins (HSPs) 60 and 70 are regulated by shear stress [9,10]. Interestingly, recent data from our laboratory have shown that shear stress induces a complete response of the heat shock factor (HSF)-1/HSP70 pathway in synovial fibroblasts by inducing DNA binding of HSF-1 (Fig. 1) and the subsequent overexpression of HSP70 . Especially in the synovial-lining layer, where the cells are directly exposed to shear stress, HSP expression can resemble a defence strategy of the cells to survive. Shear forces, although certainly present in normal joints, can vary greatly and directly depending on the quantity and quality of exercise that the person performs. In addition, synovial proliferation and cartilage destruction during arthritis are likely to be factors affecting the intensity of the shear forces present in the joint. Activation of synovial fibroblast-like cells by heat shock factor. Gel mobility-shift assay of heat shock factor (HSF)-1 DNA binding in human synovial fibroblast-like cells. HSF-1/DNA complexes are not present in unstimulated cells (control), whereas shear stress, and also heat stress, lead to a strong increase in the DNA-binding activity of HSF-1. Specific binding can be blocked by an excess of unlabelled oligonucleotide; unlabelled oligonucleotide inhibition (COI) is the ratio of unlabelled to labelled oligonucleotide (50:1, 10:1 and 1:1). Heat is another physical stress factor present in the inflamed synovial membrane. Flares of disease activity based on an increased inflammatory activity lead to hyperaemia and the release of pyrogenic substances. Thus, hyperthermia is a frequent and long-known symptom of arthritis. Heat stress can induce matrix metalloproteinases , for example, which participate in tissue destruction during RA. Transduction of heat to biochemical signals has been studied for several decades and the heat shock response of cells has become a favored topic during recent years [13,14]. HSFs were discovered as signal transducers of heat stress and HSPs as the effector molecules that allow cellular adaptation to heat . The function of HSPs is to protect the folding of nascent proteins, the refolding of denatured proteins and the solubilization of protein aggregates especially under conditions of heat stress . Several multimember families of HSPs have been discovered and are characterized by their molecular mass and intracellular localization. Although heat is the most typical inducer of HSPs, other stress factors such as shear stress , oxidative stress  and proinflammatory cytokines  can also induce certain types of HSP. In comparison with the large number of investigations on autoimmunity against HSPs in RA , studies on the expression of HSPs in the synovial membrane and on the factors leading to synovial HSP expression have been rare. HSP60 is the human homologue of mycobacterial HSP65, and the cellular and humoral autoimmune responses to both isoforms have been studied for many years in RA [21,22]. HSP60 is expressed in the synovial membrane of patients with RA  and juvenile RA ; however, the synovial tissues of normal and osteoarthritis patients also express a considerable amount of HSP60 . The predominant localizations are the synovial lining, the synovial endothelium and the cartilage–pannus junction ; in addition, synovial lymphocytes also express HSP60 . The factors leading to synovial HSP60 expression are not known, but heat is obviously not the only factor because normal and osteoarthritic synovial membranes also express this stress protein. Shear stress, for example, has been identified as an inducer of HSP60 in endothelial cells  and it is conceivable that shear stress might have a role in HSP60 expression in the synovial lining and endothelium. The expression of HSP60 in the synovial membrane is likely to exert a protective role on stressed cells. Interestingly, rat strains resistant to adjuvant arthritis express HSP60 abundantly in the synovial membrane, whereas arthritis-prone Lewis rats fail to show a significant expression of HSP60, an observation that suggests a protective role of this molecule against arthritis . Overexpression of HSP60 might also explain the development of an autoimmune response to this protein because overexpression might go along with altered localization of this normally mitochondria-localized protein [28,29]. Similarly to HSP60 expression, the presence of an autoimmune response directed to HSP60 is associated with a protective rather than a pathogenic effect in both adjuvant and human arthritis [30,31,32]. Besides HSP60, the inducible form of HSP70 is also expressed in the synovial membrane, but its expression is confined to the RA synovial membrane and it is not found in the synovial tissue of osteoarthritis patients . HSP70 is strictly regulated by the activation of its transcription factor HSF-1; the activation of HSF-1 is also characteristic of the synovial membrane of RA patients but not that of osteoarthritis patients. HSP70 expression is predominantly found in the synovial-lining layer, in both synovial macrophages and fibroblasts (Fig. 2a). Besides heat stress, proinflammatory cytokines, especially tumour necrosis factor-α (TNF-α) and interleukin (IL)-1, and also shear stress were identified as the factors leading to the expression of synovial HSP70 . HSP70 protects cells against a variety of toxic conditions such as oxidative stress, TNF-α, heat shock, heavy metals and cellular damage after ischaemia. In addition, HSP70 overexpression has been shown to be protective against apoptotic death; synovial cells expressing elevated HSP70 levels might therefore develop a certain resistance to apoptosis [33,34]. This would be in line with the observation of the low frequency of apoptosis in rheumatoid synovium despite the abundance of apoptosis-inducing factors [35,36]. Besides HSP70, other anti-apoptotic signals, such as a protein called sentrin, are observed in the synovial membrane , and it remains to be elucidated whether other heat shock proteins are also expressed in the synovial tissue of RA. HSP27 might be a good candidate because it is activated by the p38 stress kinase pathway, which is a part of TNF-α signalling . Expression of hsp70 (a) and phosphorylated p38 protein kinase (b) in the synovial-lining layer. Immunohistochemistry of synovial membranes of patients with RA shows a hypertrophic synovial-lining layer. 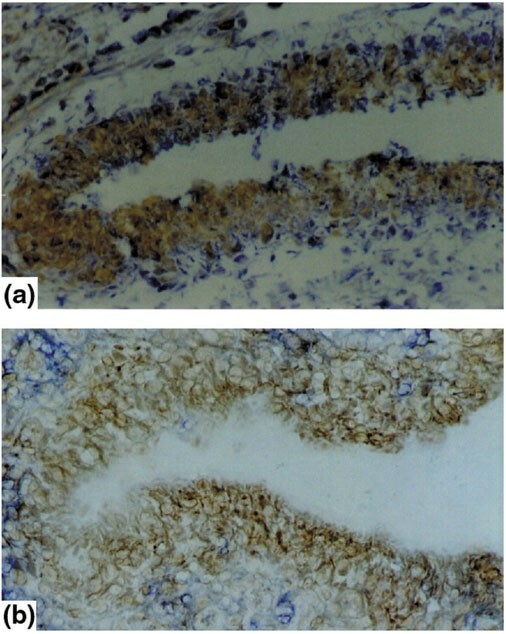 (a) Immunostaining for heat shock protein (HSP)70; (b) staining for phosphorylated p38 protein kinase (brown). Both molecules show strong expression in the synovial-lining layer of patients with RA. As well as physical stress factors, the synovial membrane is targeted by a number of proinflammatory cytokines, which trigger and fuel the chronic inflammatory process in the synovium by governing a variety of pathophysiological processes including cell activation, cell proliferation, tissue resorption and chemotaxis [39,40,41]. In particular, TNF-α and IL-1 have been identified as major pathogenic mediators in RA, inducing and propagating a chronic inflammatory process in the synovial membrane . Both cytokines and their receptors are overexpressed in the synovial tissue of patients with RA in comparison with degenerative joint disease [43,44,45,46], and inhibition of their action has proved to be a useful therapeutic strategy [47,48]. There is a wide range of cellular responses to TNF-α, some of which, such as proinflammatory cytokines [49,50] and metalloproteinase synthesis , chemotaxis  and the induction of apoptotic cell death , are likely to be involved in synovitis. As a consequence, the signalling pathways of TNF-α and IL-1 are complex, and several groups of intracellular signal transduction molecules participate in them. The most important of these are the NF-κB pathway , the caspase cascade  and the mitogen- and stress-activated protein kinases (MAPK/SAPKs) [56,57]. The functions of NF-κB activation and of the caspase cascades in the synovial membrane have already been described elsewhere  and will therefore not be reviewed here. We have recently focused our attention on signalling by the MAPK/SAPK pathway, which represents the cellular integration of stress signals, namely cytokines and mitogens. In the synovial membrane of RA patients, all three known MAPK/SAPK signalling pathways are activated, including the extracellular signal-regulated protein kinase (ERK), c-Jun amino-terminal kinase (JNK) and p38 pathways [58,59]. In contrast, synovial membranes of degenerative joint disease show almost no MAPK/SAPK activation [58,59], indicating the essential role of inflammation as the basis for synovial MAPK/SAPK activation. Each MAPK/SAPK signalling pathway has a relatively distinct localization within the synovial membrane. Signalling by p38 is found predominantly in the synovial vascular endothelium and in macrophages and fibroblasts of the synovial-lining layer (Fig. 2b). In contrast, ERK signalling is typical of areas of the synovial membrane located around synovial microvessels and is not found in the synovial endothelium (Fig. 3). Finally, JNK activation is seen in the sublining regions, where especially mononuclear cell infiltration containing macrophages and T cells signals through the JNK pathway. The differential synovial expression of stress signalling pathways (Table 1) underlines the variability of cellular responses to stress factors in different subcompartments of the synovial membrane. Cytokines such as TNF, IL-1 and IL-6 have been demonstrated to be the major inducers of all three stress kinases in human synovial cells; however, several other factors, such as growth factors in ERK signalling, heat stress in p38 signalling, and other cytokines such as fibroblast growth factor and vascular endothelial growth factor might have additional roles. Expression of phosphorylated p38 protein kinase and ERK protein kinase in synovial microvessels. Immunohistochemistry of synovial microvessels of patients with RA show the expression of phosphorylated p38 protein kinase in synovial endothelial cells (a). In contrast, the phosphorylated ERK protein kinase (b) is not expressed by synovial endothelial cells but by cells surrounding the synovial microvessel. Stress kinase activation in the synovium largely depends on the type of stress kinase signalling but also on the cell type using the signalling pathway. Thus, synovial endothe-lial cells, for example, show p38 activation (Fig. 4), which might be due to the effect of TNF-α or IL-1; however, vascular endothelial growth factor might also have a role because this growth factor uses p38 signalling for angiogenesis . Endothelial p38 activation is known to be important for crucial endothelial functions: chemoattraction by inducing the expression of E-selectin , vascular cell adhesion molecule-1  and macrophage chemoattractant protein-1 ; angiogenesis by inducing the activation of ETS-1 transcription factor , which is overexpressed in the synovial membrane of RA  (Fig. 4); and vasodilatation by inducible nitric oxide synthase (iNOS) . In contrast, in the synovial-lining layer, the function of p38 might be completely different because it might exert its activity as a transcriptional inducer of proinflammatory cytokine synthesis [67,68]. Thus, p38 activation in the synovial lining is likely to be a central mechanism in the development of a hypertrophic and destructive synovial lining, which is most actively involved in synovitis. Expression of phosphorylated p38 protein kinase and transcription factor ETS-1 in synovial microvessels and synovial endothelial cells. 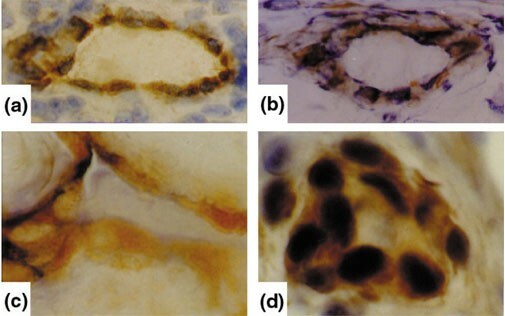 Immunohistochemistry of synovial microvessels (a,c) and synovial endothelial cells (b,d) of patients with RA shows the expression of phosphorylated p38 protein kinase (a,b) and ETS-1 transcription factor (c,d) in the endothelium of synovial microvessels. As regards the activation of JNK, its expression by mononuclear cells might reflect the production of IL-6, IL-8 and matrix metalloproteinases in situ by these cells, because JNK signals the transcriptional activation of these proteins [69,70]. In contrast, JNK activation in synovial T cells might mirror the fact that JNK is essential for T cell effector function and stimulates T cells to differentiate into a T helper 1 type . The fact that recent progress in pharmacological research has led to the development of selective inhibitors of all three MAPK/SAPK pathways will provide further insights into the role of each of these pathways in the pathogenesis of RA. Their therapeutic use is under investigation and might prove to be a new and fascinating targeted therapy . Finally, there is experimental evidence for the presence of oxidative stress in the synovial tissue of RA. An example is thioredoxin, a cellular catalyst induced by oxidative stress, which is overexpressed in synovial cells and tissue of patients with RA . Thioredoxin, which is induced by TNF-α, acts as a co-stimulatory factor for the TNF-α-induced synthesis of IL-6 and IL-8 by synovial fibroblast-like cells . Furthermore, thioredoxin acts in a proinflammatory manner by activating the NF-κB pathway . However, several mechanisms of antioxidative functions are present in the synovial membrane of RA: metallothioneins are cytosolic proteins protecting cells from metal toxicity and oxidative stress , and they are expressed particularly in synovial fibroblasts in the lining layer and to a smaller extent in the sublining regions. Thioredoxin reductase is an antagonist of proinflammatory thioredoxin and is also produced in situ in the synovial membrane of RA, thus counterbalancing the effects of oxidative stress and thioredoxin . As a third regulatory system, the activity of glutathione reductase is also increased in patients with RA . However, these mechanisms might not fully counterbalance oxidative stress in the synovial membrane of RA and therefore might not prevent the exposure of synovial cells to reactive oxygen products . There is experimental evidence that oxidative stress can induce mutations of key regulatory genes, including the p53 tumour suppressor gene [77,78,79]. These mutations could be part of the self-perpetuation process by which RA becomes a chronic condition. Shear stress, heat stress, cytokine stress and oxidative stress are the hostile conditions to which cells are exposed in the synovial membrane of RA. Given that the rate of apoptotic cell death in the synovial membrane is rather low, it is obvious that synovial cells have adapted to these stressful conditions and manage to survive. Thus, the cellular response to the stress factors in the joint in general is not cell death, but instead cellular activation, proliferation and participation in a chronic inflammatory process. Signalling systems such as the p38 stress kinase pathway can drive cells into apoptotic death; however, in RA, p38 is likely to be centrally involved in synovitis, thus signalling inflammation and tissue proliferation. The resistance of synovial cells to stress is an important observation and might be associated with the expression of HSPs in the synovial tissue, which can protect the cells from apoptotic death. It seems that this balance between stress factors and the cellular stress response influences the course of synovitis to a similar extent to the balance of pro-inflammatory and anti-inflammatory mechanisms. Thus, the stress response might be an integral part in, and a significant cause of, the chronic nature of RA. Investigations into the molecular actions of stress in the inflamed joint are therefore of great importance to our better understanding of the events taking place in the synovial membrane in RA. Targeting stress pathways by specific therapies, such as inhibition of the p38 pathway, might become increasingly important and represent new and potentially effective therapeutic tools.